Bathed in an intoxicating mixture of magnolia and moonlight, her classic beauty is unsurpassed. Find an adventure in Milledgeville. If you want to get down, then get downtown! Locally-sourced restaurants, original live music and organic coffee shops are steps away from fascinating museums, impressive art galleries, trendy fashion boutiques and funky antique stores. Turn off your GPS! Hop on board an authentic trolley and tour historic mansions and museums without a map. Then, relive your glory days with a trip down memory lane through the vibrant Georgia College campus, bustling with electric energy and located right in the heart of downtown Milly. Just like every true southern belle, Milly is full of surprises. If you just want to chill, kayak or canoe on the meandering Oconee River and practice yoga in a pristine park. Hike leisurely along the famous Bartram Trail or book a boat on Lake Sinclair. Make a date with Milly, downtown after dark. Order a round of craft beers and wood-fired pizza at The Brick and try signature margaritas at Gringo’s local taqueria. Enjoy haute cuisine and sip champagne in a plush wine cellar at Aubri Lane’s. Mix and mingle with martinis and an amusing mix of characters, like professors and professional anglers....or history buffs and history majors. Milly is waiting for your call. Milledgeville, Georgia offers visitors a look into the past, a past that is steeped in a rich history, when Milledgeville was the Antebellum Capital of Georgia. Visitors can explore historic gems like the Old Governor's Mansion, part of Milledgeville's Museum District and home to the governors of Georgia from 1838 to 1868, or Andalusia, Flannery O'Connor's Farm. 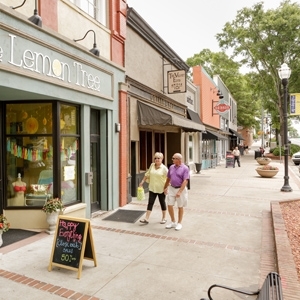 Milledgeville has a scenic location, southeast of Atlanta and northeast of Macon, along the Oconee River. You can relax and enjoy the slower pace of life in Millegeville while soaking in all of the warm southern hospitality. When planning your visit, be sure to check out our suggested itineraries, and don't miss our selection of fine hotels and main street city restaurants. Beneath the sun-dappled shade of seductive towering oaks, Milledgeville uses feminine wiles to lure travelers to sample her charms. Listen to live bluegrass at Andalusia and make a real connection at Deep Roots Music Festival. Find a new perspective at contemporary art shows and view traditional collections in eclectic galleries. See where Sherman slept at the Old Governor's Mansion and take an African American heritage tour. Enticing guests with impressive architecture, historic haunts, and cultural events, Milly knows how to show you a good time. Georgia College is Georgia's public liberal arts university, located in Milledgeville, offering the community multiple involvement to participate or watch a performance. Downtown is walk-able from shops to dining to hotel accommodations. A vehicle would be needed to access the lake. Jan 32.8 F° 44.6 F° 56.5 F° 5.0 "
Feb 34.9 F° 48.0 F° 61.1 F° 4.5 "
Mar 41.5 F° 55.2 F° 69.0 F° 5.0 "
Apr 47.5 F° 61.9 F° 76.2 F° 3.2 "
May 56.6 F° 70.0 F° 83.3 F° 3.0 "
Jun 65.1 F° 77.3 F° 89.6 F° 3.6 "
Jul 69.3 F° 80.8 F° 92.3 F° 4.1 "
Aug 68.3 F° 79.6 F° 90.8 F° 4.1 "
Sep 62.5 F° 74.2 F° 85.8 F° 3.5 "
Oct 49.7 F° 63.4 F° 77.0 F° 2.6 "
Nov 41.0 F° 54.5 F° 68.0 F° 3.4 "
Dec 34.5 F° 46.9 F° 59.1 F° 3.8 "